Dusing Group from Kentucky Made up of Paul, Son Joe, from Florence and Covington, Brother Ralph from Wilder, Father son combo Ton & Kevin Annear from Burlington & Union, Ken Kopp from Burlington, JR Feagan from Verona& Gene Cochran from Covington were all trilled to arrive.1st day all went out with excitement despite strong winds and all caught fish. 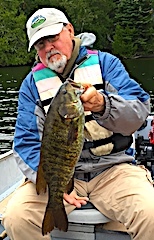 2nd day Ken and JR did very well catching Smallmouth Bass on plastics and a few Pike, Ton & Kevin said they caught a lot of Smallmouth Bass on small spinners and Ralph while fishing with Gene caught a Nice 31.5-inch Northern Pike. The fish chased a Smallmouth he was catching and swam off, so he threw his crayfish lure back to it in that direction, the Pike slammed the lure and as Ralph said the fight was on ending with a nice picture of Ralph holding his catch. 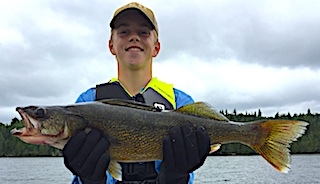 3rd day they all did very well catching many Northern Pike along with a few Smallmouth Bass and Kevin landed a 32.5-inch Northern Pike to take the lead in the main competition among the group for largest fish caught. As a Group they caught 50+Fish for the day. 4th and final day all the guns were smoking to win the money pot for the largest fish caught during their stay. 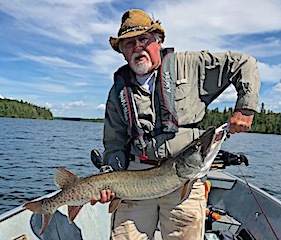 And all gave it their best but the winner ended up to be the 80-year old rookie Gene, never fishing in Canada before, catching a 42-inch HUGE Muskie on the last afternoon of their trip. Another special even this group had been a retirement celebration for Ralph who retired after working almost 50 years. All left having a wonderful time making many memories among family and friends. 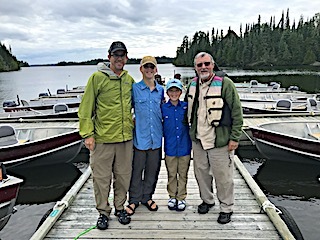 Bob Roud from Massillon, OH, son-in-law JP Sexton, Jon Melnichenko, Mark SchoolCraft and Dan Farrar all from the Cleveland, OH area were fishing at Fireside Lodge for their first time. 1st day they spent getting accustom to the lake and did well catching some Smallmouth Bass and Northern Pike. 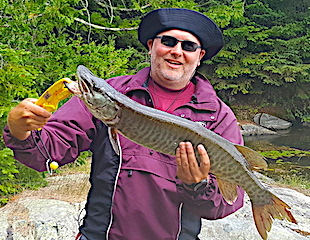 Bob caught a nice Muskie and JP caught his very 1st Muskie. 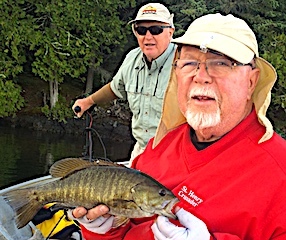 Bob also caught a Trophy 18.5 inch Smallmouth Bass. 2nd day all had a great day catching Northern Pike, Mark & JP catching 46 Northern Pike, with 20 bigger Pike caught using a twitch bait technique Mark and I discussed after he purchased a Yo-Zuri from my tackle shop. It worked so well he purchased two more at suppertime. 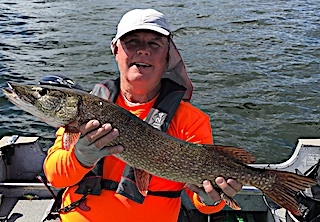 Bob, John, and Dan also did well catching 23 Northern Pike. 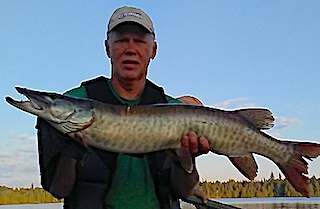 Bob had the catch of the day landing a big 35-inch Muskie. 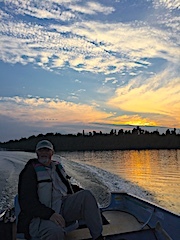 3rd day was fabulous fun all catching many Northern Pike with Bob catching over 20 himself, and Mark caught over 25 being on the leader board for the day. 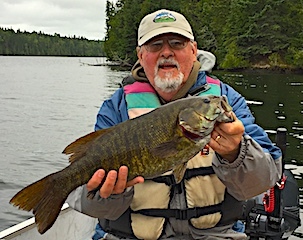 Also Bob caught a Special 19.5-inch Trophy Smallmouth Bass. 4th day they all caught a lot of Smallmouth Bass and Northern Pike, no monsters but had fast action and fun. 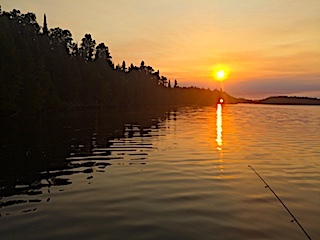 5th and final day they had a ball catching a bunch of Pike and Smallmouth Bass fishing right to the last daylight hour of their trip. 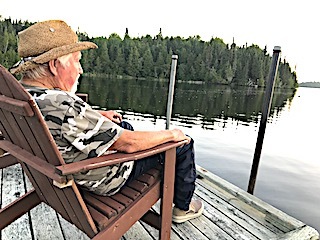 Last night a dinner they told me that they had an exceptional stay with us at Fireside Lodge between our services and the memories made among family and friends. Tyler Tennant from Lakeway, TX and Pete Higman from Gurnee, IL returned for their`16th trip with us at Fireside Lodge. 1st day these two got back into the swing by catching numbers of Northern Pike and Smallmouth Bass while searching for larger fish. 2nd day was fewer fish but what they were looking for being bigger fish. 3rd day they had a great day chasing Muskie, having a lot of follows, but also catching their fair share of of Smallmouth Bass and Northern Pike. 4th and 5th days they caught a lot of fish mostly Northern Pike, along with some Smallmouth Bass Tyler saying that most were in the smaller to mid size range. One interesting happening as Tyler was catching a Smallmouth Bass it started to go into a frantic spell and then a Muskie showed up on its tail. Well the chase was on and after several seconds the Smallmouth just went still. The Muskie got closer, and closer almost touching the Smallmouth Bass and then just swam away. So you wonder why we don’t catch fish at times? 6th and final day they had a fabulous day catching fish everywhere they stopped and saw several very large Muskie. Both had another wonderful time making another set of Fishing Memories together. 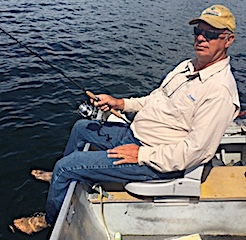 Fred Dee from Iowa City, IA returned for his second time bringing Son-In-Law Kevin Gracey and his two sons Harrison and Jonathan from Dunwoody, GA. for their first time. First day was spent catching a few fish and getting reacquainted with our lake system. 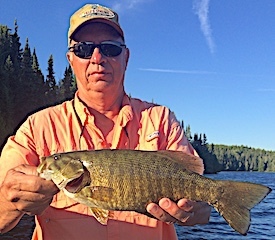 2nd day was a great success with Jonathan catching a very large 17-inch Smallmouth Bass plus Harrison & Fred doubled up on Trophy Smallmouth Bass landing a 19 and 18-inch Smallmouth Bass respectively. 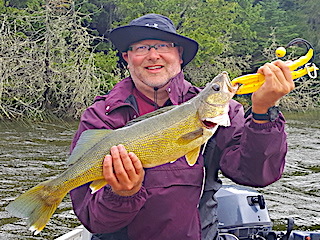 They also caught some nice Northern Pike in the 26 to 30-inch range. 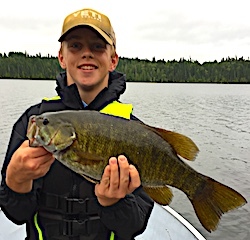 3rd day was another good Smallmouth day with Grandpa coming up with another 18-inch Smallmouth Bass and Harrison caught a HUGE 24-inch Walleye. 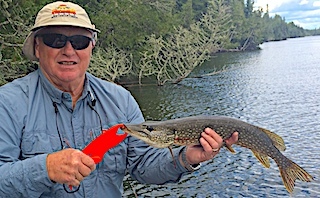 They also caught some nice Northern Pike having a great day making family fishing memories. 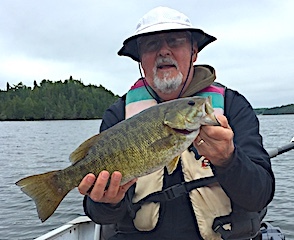 4th and final day was great catching lots of fish by noon, with Fred catching a Monster 20-inch Trophy Smallmouth Bass and all had an afternoon rest. 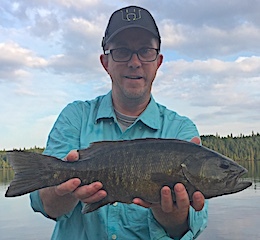 They finished up with and evening fish after supper where Kevin and Jonathan teamed up with a great evening fish landing a 19-icnh Trophy Smallmouth Bass. All had a FABULOUS time fishing together and making some wonderful family memories. Thanks for choosing Fireside Lodge to enjoy your special family time.